NYC promoters BangON! 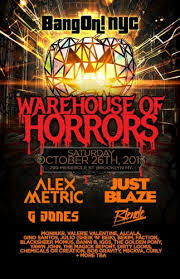 are bringing back their Annual Halloween Festival, "Warehouse of Horrors" this Saturday October 26th to Brooklyn. 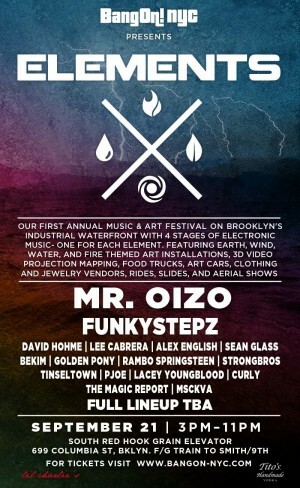 The festival will be held in a massive multiroom warehouse complex in Brooklyn NY. The event will feature 2 indoor stages, a tented outdoor area with a Silent Disco featuring BangOn!NYC Boombox Van vs. Thunder Gumbo Art Car, a full sized Haunted house with actors, 1 way mirrors, trap doors and plenty more thrills, a 3D interactive Bubble Room by Good Peoples, a Giant video mapped Monster Head, a Live suspension show, Acrobatic performances by Lady Circus, the Vendor Village featuring local artists, costumeware, designers, burlesque trick or treat, Scoops NY frozen ices, food vendors and more. Be sure to grab your tickets now! Where: 299 Meserole St Brooklyn NY off the Montrose L train.